Althea Gibson, approx. 1957. Courtesy Johnson Family Archives. 1927 Althea Gibson is born in Silver, SC, on August 25, 1927. 1930 Family moves North to Philadelphia, PA, then settled in Harlem in New York City. 1939 At age of 12, Althea becomes New York City women’s paddle tennis champion. 1941 Althea enters—and wins—her first tournament, the American Tennis Association (ATA) New York State Championship. 1944 Althea moves to Wilmington, NC, and lives with Dr. Hubert Eaton and family. Attends Williston High School in winters and spends summers in Lynchburg, VA, with Dr. Robert W. Johnson and family, working in her tennis game and traveling to ATA tournaments. 1949 Althea becomes the first black woman, and the second black athlete (after Reginald Weir), to play in the USTA’s National Indoor Championships. She lost narrowly in the second round in a rain-delayed, three-set match toLouise Brough, the reigning Wimbledon champion and former U.S. National winner. Entered Florida A&M University on a full athletic scholarship. 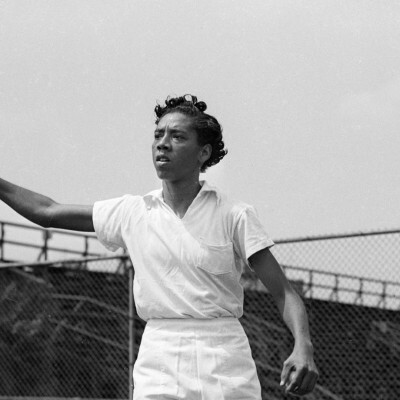 1950 Althea is first African American to play the U.S. Nationals, at Forest Hills in Queens, New York City. She loses to Louise Brough in second round. 1953 Graduates from Florida A&M University. 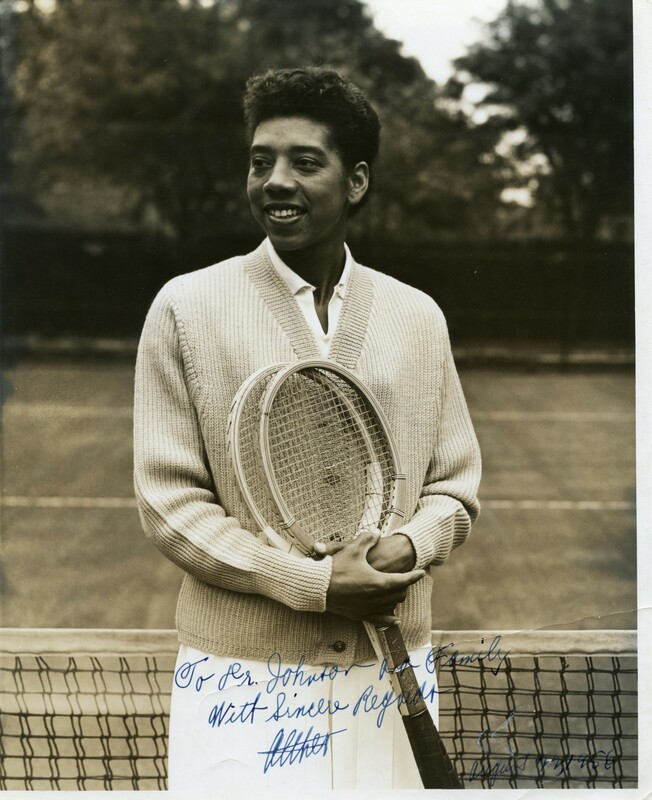 1955 The U.S. State Department sends Althea Gibson on a goodwill tour of Asia to play exhibition matches withHam Richardson, Bob Perry, and Karol Fageros. 1956 Althea wins French Open singles and doubles at French Open and Wimbledon (both with Angela Buxton). 1957 Althea wins Wimbledon and U.S. Nationals. She is the first African American to win either tournament. Upon her return home, Gibson became only the second black American, after Jesse Owens, to be honored with a ticker tape parade in New York City. 1958 Althea repeats her single title wins at both Wimbledon and U.S. Nationals, and retires from tennis. She was the number-one-ranked woman in the world and in the United States in both 1957 and 1958, and was named Female Athlete of the Year by the Associated Press in both years, garnering over 80% of the votes in 1958. She also became the first black woman to appear on the covers of Sports Illustrated and Time magazines. 1959 Althea is signed to play a series of exhibition matches against Karol Fageros before Harlem Globetrotter basketball games. Her record album Althea Gibson Sings is released in 1959, and Gibson performs two of its songs on The Ed Sullivan Show. She also appears as a celebrity guest on the TV panel show What’s My Line? and was cast as a slave woman in the John Ford film The Horse Soldiers (1959). 1960 Her first memoir, I Always Wanted to Be Somebody, written with sportswriter Ed Fitzgerald, is published. 1964 At the age of 37, Althea Gibson became the first African-American woman to join the Ladies Professional Golf Association (LPGA) tour. She marries William Darben (they divorce in 1976). 1976 Althea Gibson is appointed New Jersey’s athletic commissioner, the first woman in the country to hold such a role. 1983 Althea marries Sydney Llewellyn. 2003 Althea Gibson dies September 28, 2003. 2013 The U.S. Postal Service honors Althea Gibson with a commemorative stamp on August 23, unveiled on the U.S. Open grounds in Flushing, NY. She is the first female athlete in the Black Heritage Stamp Series.